Finally! 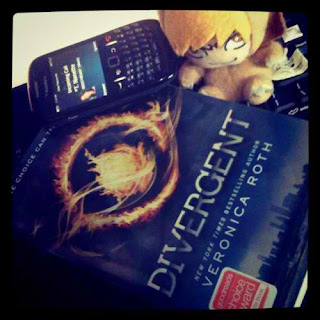 I was able to finish Divergent by Veronica Roth after a week of “interrupted” reading. I had work. I was always I asleep. I just could not squeeze it in. I even had this strange thought that maybe it’s not actually as good as everyone says it is. But! But! But! I beg to defer! I think it’s one of the best dystopians out there.Haha.I simply could not find the time to read it. Anyhoo, the main characters of the story are Beatrice “Tris” Prior and “Four”.Hahahaha. Read the book so you’d know what “Four’s” real name is! I honestly loved this book from page 1.I just had to work and train this newbie at work since I’ll be changing patients in a few days. And thus, the lack of time to actually read while on duty. haha.The concept of the story is just like any other dystopian novels where tyrant leaders are involved. But somehow, the author made it into something unique. The faction concept somehow confused me in the beginning.Seriously, I had to look up the meanings of each name. haha.But still, I liked that. It helped broaden my vocabulary. I liked Beatrice “Tris” Prior as a character. She’s different and she knows it. And again, since I don’t want to spoil anyone I won’t mention the reason why she’s different. haha. Just read it.Somehow, deep inside of her she always knew that she was different from everyone from her faction which is Abnegation. And when the time came for her to decide whether to stay or leave I think she was at least able to choose the right faction for her. I am no longer biased when it comes to judging female characters. I seriously liked Tris. She’s not annoying. Not the typical damsel in distress. I actually liked the brute side of her. Not a weakling per se. I liked the fact that she’s not your average girl-in-love or stupid-whiny-girl character. I seriously loved the tough chic there. Then of course, there’s Mr. Hottie himself, Four. I am seriously, in love with Four right now.Haha.I love his I-am-so-tough-and-yet-I-am-sensitive persona. I just can’t help but love him. I seriously understand why Tris likes him. I seriously have no idea why I like men who can treat a woman with brute force and gentleness at the same time. I just don’t know. I think Four is one of those characters that I just can’t help but fall in love with. Overall, I enjoyed reading Divergent as I got deeper into the story. The fact that there are no lame characters in the book makes it oh so awesomefor me. Plus, the fact that Tris can actually hit Four without being such a girly girl. haha. Love that part. Overall, I enjoyed reading this book. I’d give this a 5/5 star rating. And I can’t wait to get my hands on the next one. I really want to start this series but, I feel like all i have been reading lately is dystopian books lol. Thanks so much for the reveiw. Yeah me too. I love this book though. You should give it a shot. You're welcome.